Accessorize..accessorize…accessorize. Just because everyone drives a car or truck doesn’t mean they all have to look the same. Take wheels for example. Many custom design and body shops provide the car enthusiast a wide collection of car wheel products. All types, looks, sizes and flair. Generally, wheels convey diverse concepts to different people around the globe. However, they remain one of the most significant discoveries of human civilization; wheels have helped activate dynamic force that is necessary for convenient travel and transport in today’s world. Just imagine what cavemen would think of spinners today? Choosing the perfect wheels, rims, lights and other parts for your car is very important. Cardinal Rule Number 1: While purchasing these parts for your car, make sure that you do not end up with goods that are stolen, lost, overused or faulty. Usually, wheels easily turn around at ten times per second or 600 times a minute. If you purchase low quality wheels for your car, they will have adverse effects on the overall performance of your vehicles. This decision of yours will most probably destroy the tire of your car at any moment or can cause sever wear and tear on bearing and other vital parts of the vehicle. Therefore, wheel design and construction are important factors to be considered while choosing car tires. Try to better understand the function, design and quality of a wheel before purchasing it. What about lights? Automobile lights are also available in different types such as headlights, tail-lights, neo undercarriage lights, interior lights that change color…if you want it they make it. These lights can make your vehicle more attractive and also to increase its exterior styling. Many suppliers that provide vehicle wheels, rims, lights, and other parts are also equipped with different types of new car and truck lights, car lighting, headlights and taillights, turn signals, fog lights and replacement lights. Many suppliers will help you in this matter by giving you top class technical support & assistance, along with great product offerings and clarifications that are necessary to ensure a long life and consistence performance of your vehicle and it’s mods. You can still remember your famous last words, “Don’t worry, it doesn’t look that deep.” If you can feel the water splashing under the undercarriage it’s too deep. The next thing you notice is water on your floorboard. Not good. Water that gets left inside your car doesn’t just evaporate without causing damage first. 1. Check carpets and upholstery. Check also door and trim panels for dampness. If they are wet, then your used car will need professional attention. Simply air-drying the carpet is not enough; you will be soon notice that mildew and nasty odors will have come out. 2. Check seat brackets, motor, and modules. Be sure they’re free of rust and properly operating. 3. Pull the engine oil and transmission fluid dipsticks and differential plug. If the fluid appears milky or diluted, is no longer its original color, or is light brown in color, then it is likely the pans contain water. Have your car repaired immediately. Driving the car with water present may damage the internal parts and require extensive overhaul or car repairs. 4. Check the air filter for water. If it is wet, replace the air filter and change the oil. 5. Check the undercarriage, bumpers, radiator area, and frame for mud, grass, dirt, debris, and rust. If any of these are present, have your used car washed and cleaned as soon as possible. Any mechanical repairs can be checked out by your trusted mechanic and get your new car back to its perfect condition. 6. Have the brake system checked by a professional. Water-logged brake systems are especially dangerous on slippery roads. 7. Check the exterior lights for moisture and water. Replace headlights and bulbs that contain water. 8. Finally, listen for abnormal noises while the engine is running. Make a note of where the noise is coming from and take the vehicle to a mechanic as soon as possible. Pay particular attention to the alternator, serpentine belt, starter, power steering unit, air conditioner, and wheel bearings. Check the suspension joints and lubricate as necessary. Many used car models are lubricated at the factory for life; however, these joints should be checked for rust as well. By being “car care aware” and following these simple guidelines can help minimize potential damage to your new or used car. If you’d like a professional opinion on the matter, you know where to find me. Do you know how to change your transmission fluid? This is a good test. Do you know what transmission fluid even is? Kidding, I know you know. You are obviously car savvy and of above average intelligence, or you wouldn’t be visiting ITDSWO (I’m trying to make it a new car catch phrase). Here’s a great step by step video on how to check and change your new car’s transmission fluid. If you think you’d like a little more assistance, we’d be happy to help you out. Now if you still think it’s too much to handle or you just don’t want to deal with the mess, swing by and I’ll give you a good deal on an oil change. Aw Man! My New Car’s Windshield has a Ding in it! Don’t let it ruin your view! Even if your windshield cracks, it doesn’t mean that it is going to fall out as you drive. Windshields are really a high-strength mix of tempered safety glass and clear plastic. The plastic is sandwiched between two layers of glass. This means that your crack would need to break through three layers in order to have your windshield actually fall out—a very unlikely scenario…well, maybe not in Dallas. If you need help with your windshield you can always give us a call…even better, leave me a comment! Whether you are a new driver or an old pro, jumping behind the wheel of a new car with a standard transmission can be intimidating if you’re a first timer. All it takes is a little practice and before you know it you’ll be wanting to spin laps at the local track. The video explains it all…Remember, practice makes perfect! Want a personal lesson for people who know their stuff? Just swing by and have a hand behind the wheel of a GMC! Can anyone share any tricks? How about slowing down without even touching your brake? New Car Financing: Most Have to Live with it, Few Without. Unless your are independently wealthy, a trust fund baby or unusually frugal, chances of you needing to finance your new car is probably a given. So, now that we know that you are going to have to rely on a lending institution to put that new GMC truck in your driveway, to out-do Jim down the street who just got one of course, you’ll want the whole financing process to be as easy as possible. There’s no doubt that financing can be one of the most stressful and difficult parts of any new car purchase. Here are some tips you can use to find the financing for your perfect set of wheels. “What can I do to lower the price of my car?” That is a question that many people ask. What many people may not realize, initially, is that financing plays a huge role in the final cost of your new car. The amount of money that was financed, the length of the loan, and the interest rate all impact the final cost of your new car. All of these things might overwhelm someone who is new to car buying, and it is certainly difficult for even those who have purchased several cars before. Using these tips though, can help anyone get the best possible deal next time they are in the market. Identify Your Needs. The potential buyer needs to understand exactly what they need in a car as opposed to what they want. While it is always nice to be able to get what you want, you only really need to get what you need. The wants are extras that can (and will) drive up the price of the car and therefore increase the amount of money that you need to finance. Know Your Price Range. Knowing your price range prior to new car shopping is going to help keep you from impulse buying something you later find you cannot afford. Impulse buying is one of the leading causes to higher financing costs. Do Your Homework. Check April issues of such magazines as Consumer Reports and Car and Driver. These popular publications issue reports about the new cars coming out that year, examining various categories such as repair rates and issues, depreciation rates, and so on. This information is all needed to be able to make sure you get the best value for the money that you are going to spend. Such information also plays a factor in how much money the lenders are willing to give you at financing time. If you have any questions about financing a new car or new truck, these guys can help. Have you ever purchased a new (or new to you) car, drive it for a bit and begin to recognize that you may have just bought a ! Now, it isn’t your fault, right? I mean, how can anyone protect themselves from buying one of these defective vehicles? The answer is easy, you have to learn how to spot a lemon, which only sounds harder than it really is. In order to spot a lemon, there are a few things that anyone can do, all of which boil down to just doing some simple homework. Check model history: One of the easiest ways to check to see if the car that you are going to be purchasing is a lemon, is to check into the model’s history. Informational sources such as the Kelly Blue Book, and Car and Driver model history is, you can get a fairly accurate description. If there is a large history of problems for a specific model, then chances are that you can expect to have similar problems with the car that you are researching. magazine, has statistical records as to the reliability of the model. Now, while it is true that you cannot base your decision simply off of what the the model history is, you can get a fairly accurate description. If there is a large history of problems for a specific model, then chances are that you can expect to have similar problems with the car that you are researching. Get a CarFax history report: By simply getting a CarFax history report (which is going to cost you about $30.00) you can be pretty much guaranteed to have almost all of the vehicles history at your finger tips. At least among the major informational categories, such as if the car was stolen, ever been in a wreck and so on. In order to take advantage of such information, you are going to need the vehicle’s identification number (VIN) and a secure credit card (one that you do not mind using online). This is typically something that you are wanting to use if you are purchasing a used car, since most lemon laws do not cover used cars. If you take a look at the stickers on a used car (if you are purchasing from a dealer) then you are going to notice that chances are it has a little box marked that says “As Is.” If that box is marked, and you purchase the vehicle, then you are agreeing to the current condition of the vehicle. Mechanic examination: If you are purchasing a used car, then you are entitled to have your potential purchase examined by a mechanic. If you don’t want to take a mechanic along, since it tends to cost money, then you just need to know what to look for. The easiest way is to keep an eye out for unexplainable wear and tear, mismatched paint job, and so on. While it may not be 100% accurate of test, it is something that can give you a fairly good idea of what to expect. In short, what the buyer needs to keep in mind is that old phrase, “Let the buyer beware.” Or, you can always go to professionals who do these things for you! 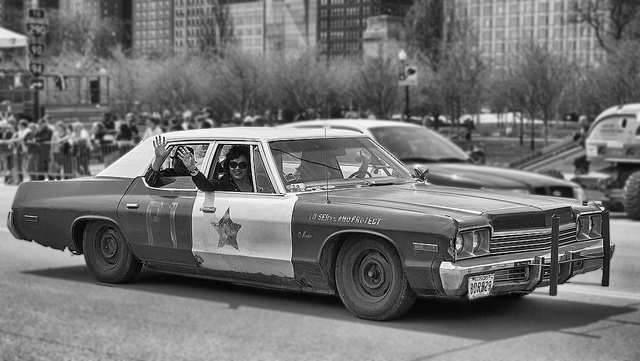 The 1974 Dodge Monaco used in The Blues Brothers might be the most famous movie car of all time. More famous than the DeLorean from Back To The Future, more famous than Herbie the VW Bug, definitely more famous than Eddie Murphy’s beat-to-hell Chevy Nova from Beverly Hills Cop, perhaps more famous even than The General Lee from the Dukes of Hazard franchise. It makes it’s debut in the opening scene of the movie when Dan Akroyd’s character Elwood Blues arrives at Joliet Correctional Center to pick up his brother Jake (John Belushi) on his release from prison. Jake of course expresses shock and disbelief that his own brother would pick him up from prison in a police car! According to Elwood, he picked it up at a Mount Prospect, Illinois police auction where “they were practically giving them away”. The duo accepts a “mission from God” to get their old band back together and raise enough money to pay the back taxes on the orphanage where they were raised. Their car seems to have magic powers and helps them all the way to the bitter end of the movie when it disintegrates into a hundred pieces. It may indeed be a magical car, but the cigarette lighter doesn’t work!! The film utilized 13 separate ’74 Dodge Monacos, some of them tricked out for stunts, some of them stripped down for speed, and of course one set up to completely fall apart. All of them were purchased as surplus from the California Highway Patrol, and at one point during the final chase scene the speedometer indicates 120 mph and according to director John Landis, that speed was accurate! Holy Moly! This might be worth a quick road trip to California the weekend of June 6th! If y’all aren’t familiar with a Night Of Destruction type event, it’s kind of like a demolition derby amusement park meets Redneck Olympics. I don’t quite know how to describe the automotive mayhem that goes on at these events, so let me add some context and we go from there OK? So, can we agree that there is a portion of the US population that ONLY watches NASCAR, the Indy 500, NHRA events, and Motocross for the crashes? Can we agree on that? Maybe we ourselves might be in that category from time to time? Maybe? Well the Night Of Destruction was invented by, for, and about those folks. It’s all about the crashes people, all about the crashes. I mean, for example, these folks put on events where you can race whatever you brung….on figure 8 track….hauling a trailer!! They even have rollover contests! They’ll put on demolition derbies for RV’s, school buses, whatever you can think of that has four wheels and a motor. Motocross not exciting enough for you? How about Demo-cross? Demo-cross with a trailer? Now of course in this nanny-state age of helicopter parents and families who have lawyers on retainer, there have to be some safety precautions. You’re not allowed to run the track in the opposite direction as the rest of the traffic for one thing. For another they do wet the track down to limit speed…and therefore impact trauma. The rules state that you can (and should) reinforce the driver’s door, but please don’t use concrete. No glass is allowed in the car, and no drugs or alcohol are allowed in the pits. 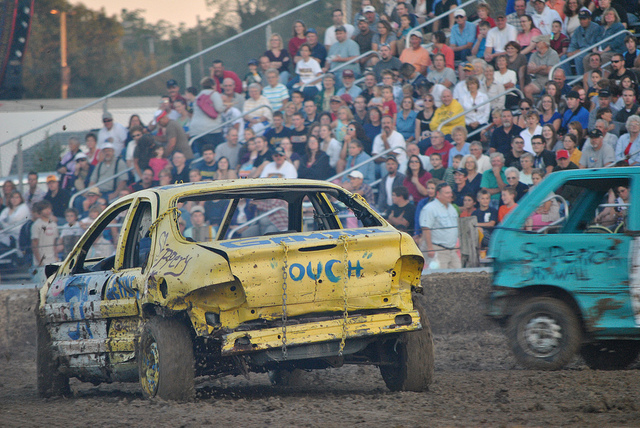 Safety belts are required (thank God), and no passengers are allowed in race vehicles. So, if you have a crazy streak, want to earn cash & prizes in the $3-500 range as well as come home with a limp and a grin, then Destruction racing might be for you! See y’all at the Perris Motor Speedway in Perris, CA June 6th!